While I was making Two-Potato Gratin a few days ago, I was thinking about The Patty Duke Show, a sitcom that was on TV from September 18, 1963 to April 27, 1966. The interesting thing is (and this was breakthrough technology in the 60s) Cathy and Patty were played by the same person, actress Patty Duke. The “cousins” were even in the same scenes together and that was really something to see when I was a child. If you don’t remember The Patty Duke Show, this synopsis is for you. Cathy Lane and Patty Lane are cousins; one lived in New York City and one lived in places all over the world. Their fathers are identical twins and, for reasons left unsaid, Patty goes to NY to live with Cathy and her family. Remarkably, the girls look exactly alike except Cathy wears a “flip” hairstyle and Patty wears her hair turned under. The similarities stop there, however, as The Patty Duke theme song describes. But Patty’s only seen the sights. Sweet Potatoes & Yukon Golds might not be identical but they are cousins and each brings its own personality to this dish. 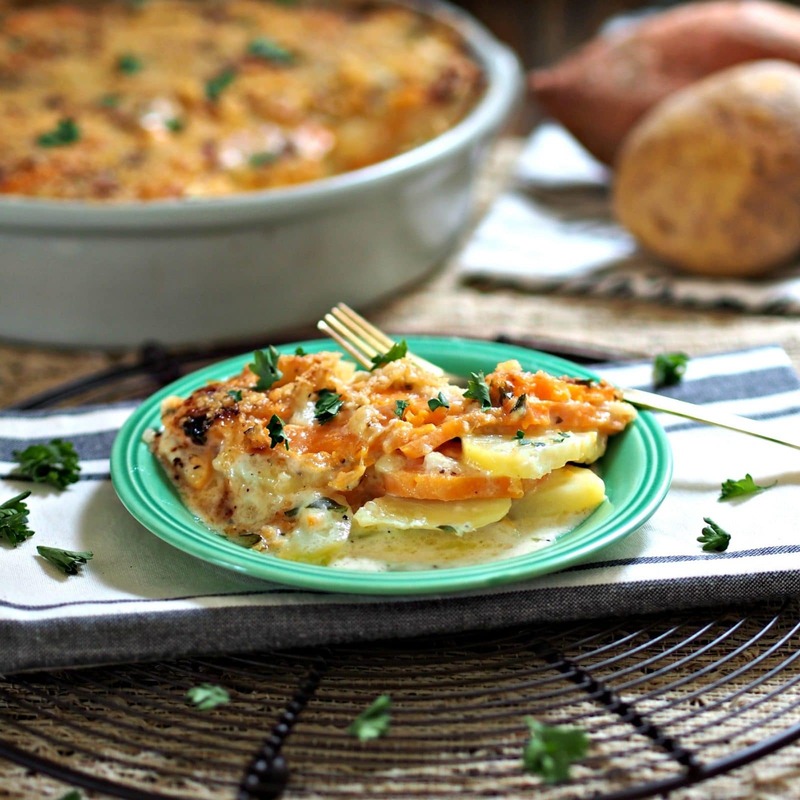 Sweet potatoes bring their natural sweetness and Yukon Golds bring that always-loved potato texture. 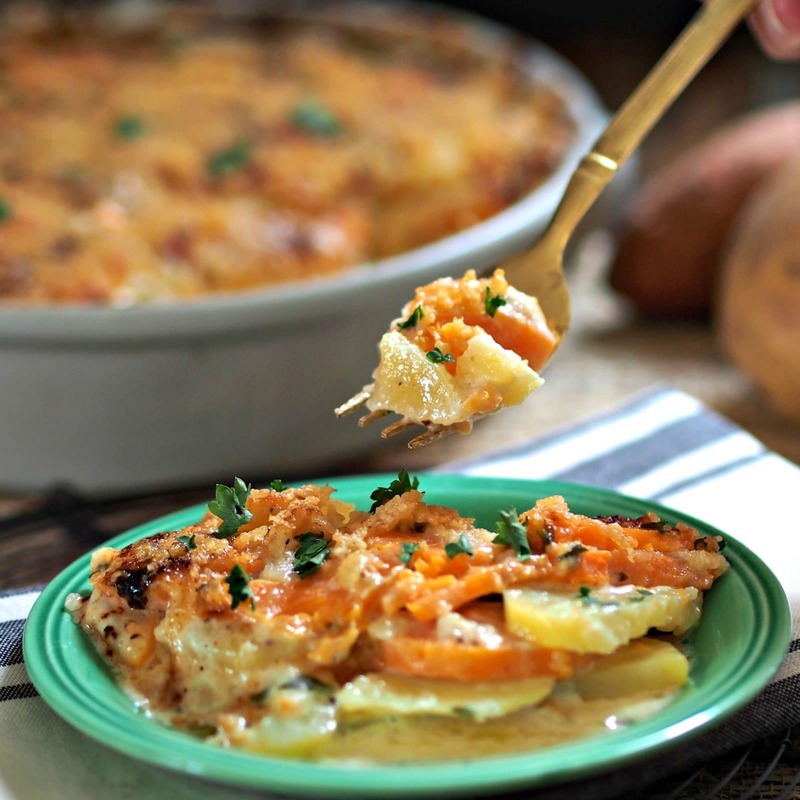 The added flavors of nutmeg, chives, rosemary, cream and the nuttiness from Gruyere cheese make Two-Potato Gratin a dish to remember. So – while I was preparing this dish, I was thinking about Sweet and Yukon Gold potatoes – and identical cousins from a 1960s sitcom. 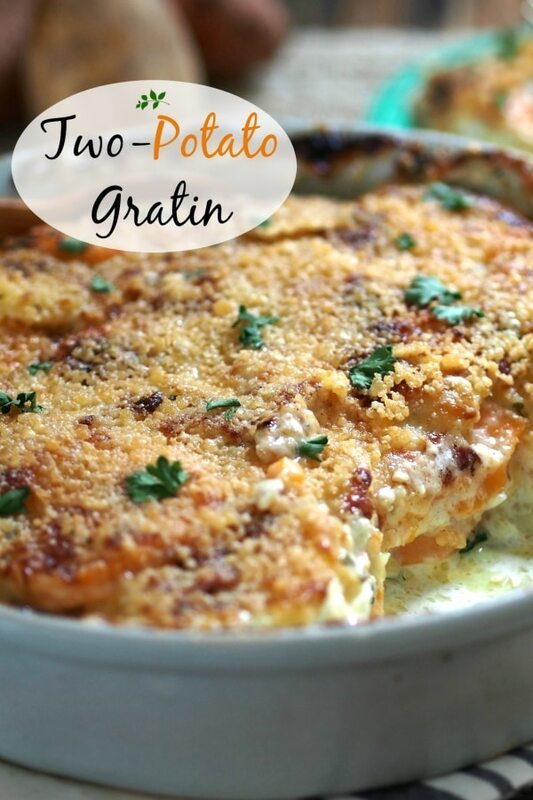 After tasting Two-Potato Gratin, I was only thinking about eating more. Spray a 2-quart casserole dish with cooking spray. In a medium saucepan over medium heat, sauté onions in 1 tablespoon butter and 1 tablespoon olive oil until translucent. Stir in cream, parsley, chives, rosemary, pepper, salt and nutmeg. Cook 2 minutes, stirring continuously. Remove from heat and set aside to cool. While cream mixture cools, combine sliced potatoes and milk in a large, microwave-safe bowl and cover with plastic wrap. Microwave at HIGH for 5 minutes, uncover and stir potatoes. Cover & microwave 5 more minutes. Drain potatoes & discard milk. Layer one-third potatoes, alternating between Yukon and Sweet, in the prepared dish. 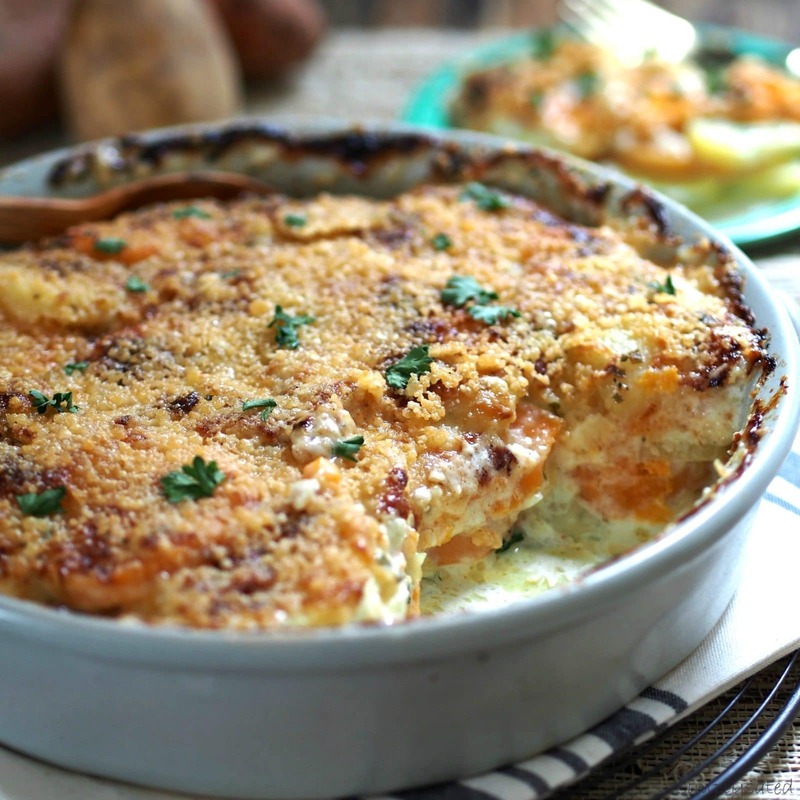 Pour 1/3 of cream mixture over potato layer and sprinkle with ½ cup Gruyere and 2 tablespoons Parmesan cheeses. 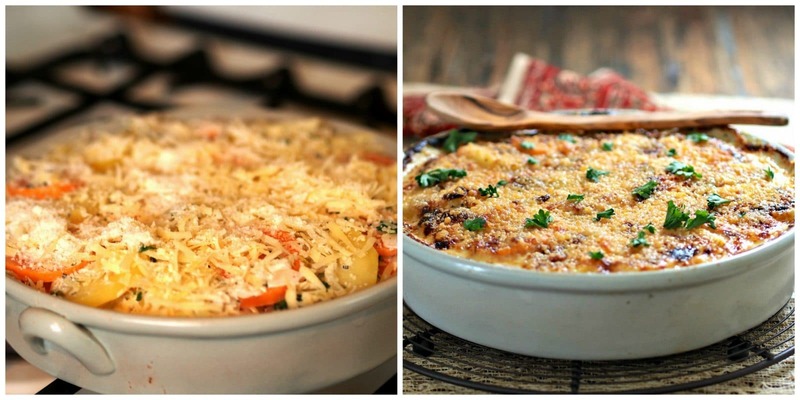 Repeat layering the potatoes and cheeses twice. The final layer will be Parmesan cheese. If desired, dot 1 tablespoon butter into small pieces over the top. Bake at 375F for 30 minutes. Uncover and bake 20-30 minutes more or until browned. 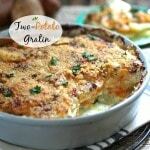 What a great take on Two-Potato Gratin....great idea. Thanks, Linda - my beautiful sister - I love ya!!! Thanks so much and thanks for coming by today!! We must be around the same age because I faithfully watched Patty Duke's show every week. 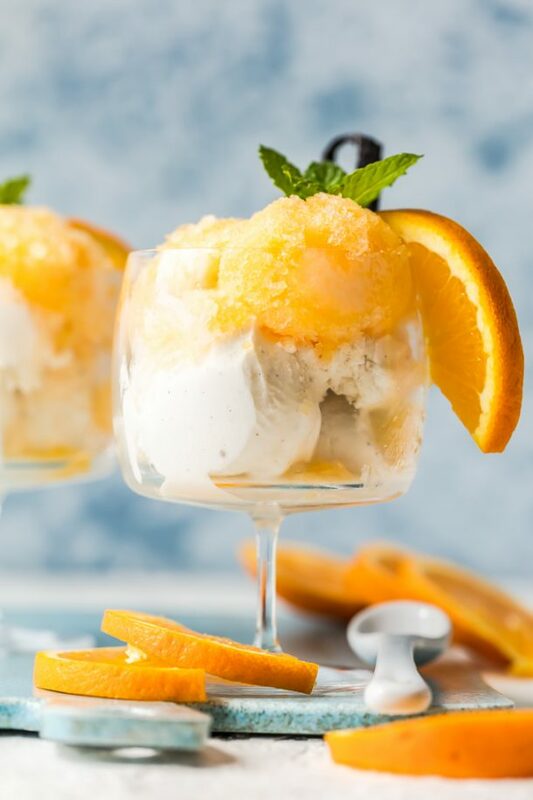 This was an entertaining post for me to read and the recipe is drop dead delicious and the photos are simply stunning! Oh, thank you, Patty. 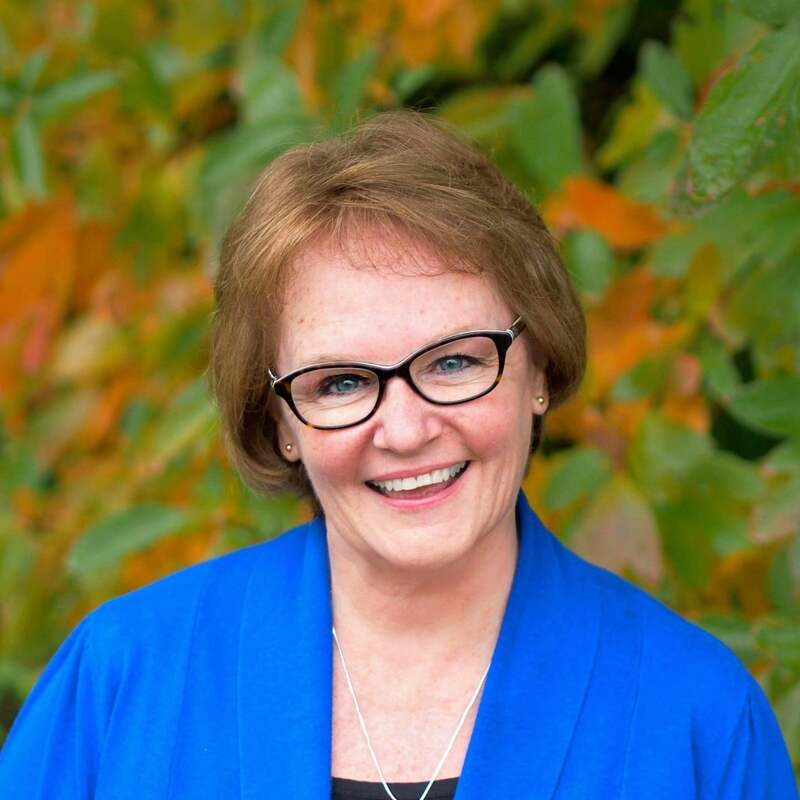 I had a soft-round number mile-stone birthday last month and I'm enjoying every second of my 60s so far:-) Well, that is until I need to learn something new.Thanks so, so much for your sweet comments about this post. After looking up the lyrics to The Patty Duke Show, that darn song has been in my head all day. I have even heard my husband sing a sentence or two today.Have a terrific evening and thanks for taking the time to stop by today. Love the idea of two kinds of potatoes! Re-pinned and re-tweeted from www.inthekitchenwithjenny.com!! Has anyone tried this recipe in a slow cooker? I don't have enough room in my oven. Thanks!